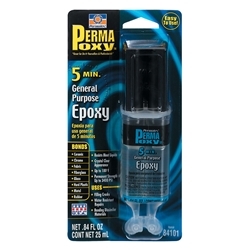 Home → Chemicals → Adhesives & Sealants → Epoxies → Permatex 84101 PermaPoxy 5 Minute General Purpose Epoxy .84 fl. oz. Versatile, easy-to-use, general purpose epoxy adhesive is two-part adhesive and filler system that eliminates the need for welding or brazing. Sets in five minutes, no clamping needed. Clear appearance. Fills gaps and will not shrink. Resistant to water and solvents.Temperature range -60°F to 180°F (-51°C to 82°C). Permanent strength up to 3400 PSI. Suggested Applications: Ideal for complex, multi-piece assemblies. Bonds rigid materials including, ceramic, chrome, fabric, fiberglass, glass, hard plastic, metal and rubber.